Every year the lovely team at Stitch and Craft in Dorset hold a ‘Challenge’ Competition. I’ve entered four times now, and every year I’ve found the process both challenging and useful – it’s the best way I know to push myself, using their topics and materials to explore new techniques and styles, and try to produce the best work I can. It’s produced some of my most successful designs (both the Baroque Tape Measure and Space Needle Case started life as elements of my first entry, a Beader’s Chatelaine) with several more from other challenges just waiting to be written up. Sometimes it’s a bit painful, sometimes it’s fun, and often as with this year I end up with something quite unexpected. So this year the theme was ‘Fit for a Queen’. We were sent three packs across the course of the year, each containing a brief and some Swarovski Elements which needed to be used. That’s always a challenge – I knew early on that I wanted to produce a set, so not knowing what colour the elements would be made things very tricky, and effectively meant that the bulk of my work wasn’t done until I’d had the third set at the beginning of this year. As I was busy on my pineapple this wasn’t a problem! My palette was etched and matte vitrail, silver, light siam and light siam AB, a smattering of fuchsia, and crystal and crystal AB. I also used some hand dyed and rolled habutai silk cord, some vintage French velvet ribbon, a lot of Nicole’s Bead Backing, some foam board, cocktail sticks, some crinkled metallic silk organza, a metal hairband and a fair amount of glue. If that sounds a bit Blue Peter, then I think the pictures of the final piece probably explain the odd ingredients. The cuff is an MRAW bezel around the supplied Crystal AB Navette with added bicone fringe, mounted on a peyote band which allows it to slide sideways so you can access the hidden catch. The antique velvet is appropriately French, the gathers onto the catch hopefully make it look like a bow as Marie Antoinette wore bows on absolutely everything. And then finally there is the tiara. In all honesty it doesn’t seem that Marie Antoinette wore tiaras – they weren’t really in vogue until a little later, with aristocratic French ladies of her time wearing ribbons, brooches and jewels in their enormous, elaborate ‘pouffe’ hairstyles. And of course they also wore funny little models – the most famous of which were ships – frigates in full sail worn to commemorate the victory of ‘La Belle Poule’ in battle. Completely barking, and I really, really just had to bead one, and somehow make it into a tiara. After some pondering and in response to a rapidly approaching deadline (and slight competition fatigue) I abandoned my original plan to bead weave one (honestly what was I thinking) and switched to bead embroidery as although the beading side is not quicker, once I’d designed and cut out the structure I would know it would work – beadweaving is way too hard to predict and design on this scale. I’d noticed that the Nicole’s Bead Backing I’ve started using is quite stiff, and wondered if I could use it for a 3d structure – so I made the hull of a frigate out of card, fiddled a bit and then got going. 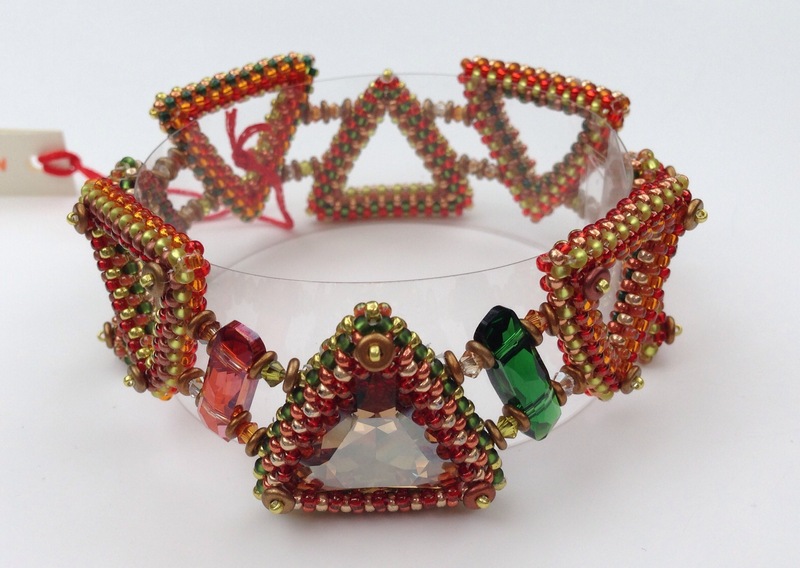 This was very much a ‘just get on with it’ experiment – my first 3d bead embroidered structure, with everything other than the flat stitching entirely new to me and completely made up. But I think in the end it worked. It’s probably safe to say that it’s not my most polished work (the wire on the masts is particularly cringeworthy) but it is beyond a doubt my most favourite beaded piece ever. Many of you have asked if it will be available as a tutorial and I can safely say absolutely definitely not – the chances of being able to recreate it in such a way that anyone else could repeat it are nil, and I think it will remain as a unique example of what trying to beat beader’s block late at night after too much wine can do. But I will be doing more bead embroidery in the future and in will definitely not be in any way flat. In the end I didn’t win (I did win last year so I think it was a bit much to hope to repeat that with such a very different entry, that was so very very bonkers), and neither did my little sister Susie Hoad (who entered the same class – we need to stop entering the same competitions for the good of family harmony). All of the entries and most especially the winners were quite amazing – the theme generated some stunning work of incredible variety, which you can see on Stitch and Craft’s Facebook page, and I really enjoyed taking part. All three pieces were great learning experiences, and two out of the three are very wearable. I’m still not sure whether I will ever wear the third………………so it will join my pineapple in some kind of suitable display, and make me smile. Last week the Stitch and Craft workshop schedule for next year came out, and it got me really salivating. Utter lushness, in the lovely Dorset countryside. 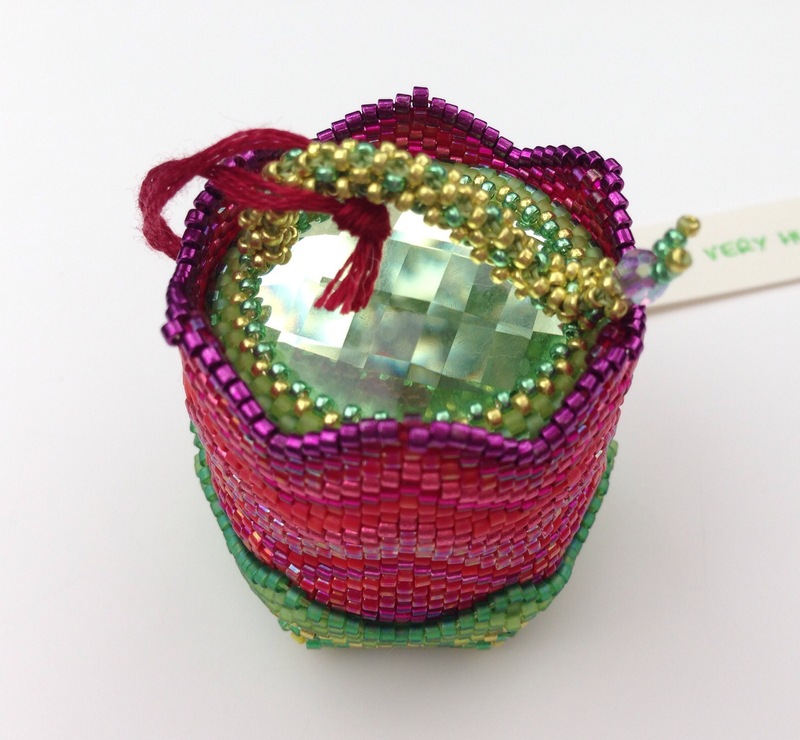 Bookings open on Thursday, and some workshops will go incredibly quickly because they are incredible designs from internationally renowned beaders. Plus they are at the SnC Studio which in itself is a beader’s paradise, and frankly worth coming up with any excuse to visit (including ‘but I really need to learn how to make this so I have to go there’). I don’t think I’ll be able to make it to any classes, family and work being what they are, but I’ve indulged myself with a little fantasy workshop selecting – perhaps one of you could go instead? So, first to some of my beady friends, starting with the fabulous Jean Power. I think I’d go for her ‘Iskra Box’, or possibly the ‘Tetra Star’, as I’ve seen elements of these in development and thought they were amazing. 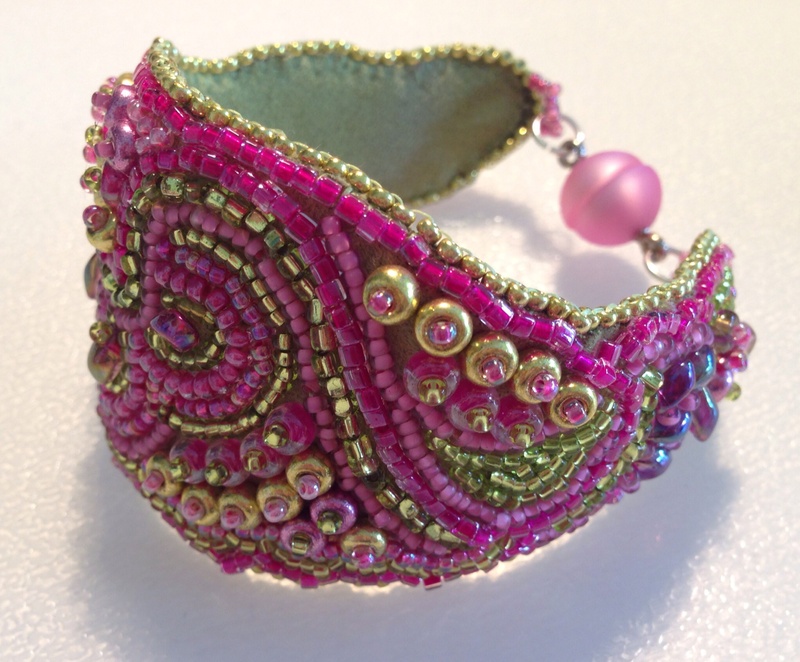 Jean’s a great teacher, and really fun to bead with – we’d have a ball. 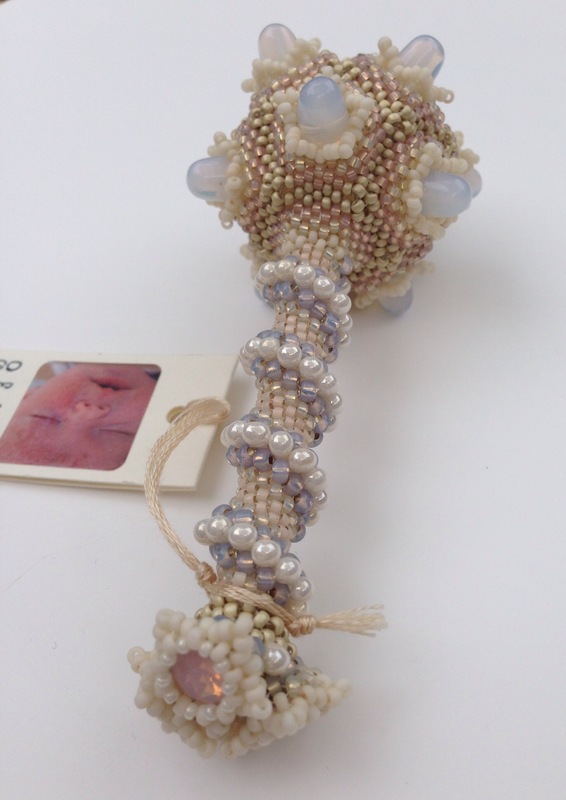 My new beady friend, Shona Bevan is teaching a few pieces – I loved her ‘CRAW Donut’ when I saw her wearing it a couple of months ago – it’s put together with such confidence and elegance, and yet it’s so daringly simple in terms of colour. Then again, she was wearing one of her ‘Borgia Pendants’ last week and that was completely lovely. Plus she is a scream in person so again we’d have a fab day. 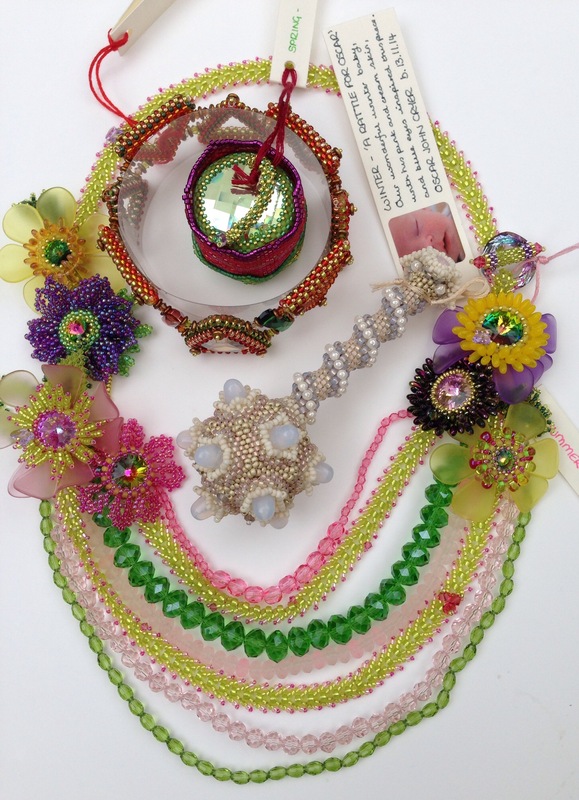 When I met Sian Nolan for the first time on the Stitch and Craft stand at the Big Bead Show, she was I think wearing her ‘Flowers in the Snow’ – I couldn’t stop staring at it so I’d love to learn how to make one. The use of I’m guessing lentils round the edges is inspired, and I have just the ones in my stash already……. As many of you know, I’m a big fan of Sabine Lippert – from her I’d go for either ‘Night and Day’ or ‘Charming’. Laura McCabe is coming over, and although she’s not teaching her more avant garde pieces, I think her ‘Modern Medieval Bracelet’ would give a good insight into some of her techniques. I’ve been trying to up skill my bead embroidery lately, and luckily my newest obsession (kicked off by the arrival of this very brochure) is the bead embroidery of Kinga Nichols. I’ve just splashed out on her Interweave video featuring a fantastic fish (and started beading it), so I wouldn’t pick that class even though it really appeals – instead I think I’d love to learn how she achieves such lovely textures and shapes in her abstract pieces, so would go for the ‘Bees Knees’ pendant – very wearable as well. Looking at some of the other classes, ‘Nuts & Bolts’ by Heather Collin (taught by Lynn Firth) caught my eye. It looks like an intriguing construction with an opportunity to play with colour, which is obviously a plus for me, and very wearable. Then the lovely Lynn is also teaching some of her own pieces as well……. There’s a bead crochet class with Gillian Lamb which might be a good idea (I really cannot get the hang of it on my own), and then there are classes from the incredibly elegant Maggie Meister, and exploration class using Hubble Stitch with Melanie de Miguel, and oh the list goes on, so it’s just as well I don’t have to choose. If you can though, do, and you will definitely have a lovely time. I’m not great at finishing things – as well as the usual UFO box of failed projects I even have a box full of nearly finished projects. Brooches needing brooch pins, pendants needing only a jump ring, and of course tutorial pieces needing writing up. Seeing so much bead embroidery in the Battle of the Beadsmith reminded me that about 3 years ago I had a go at it, and had an almost finished piece cluttering up my beading cupboard. So I girded my loins, dug out my bead embroidery book (Jamie Cloud Eakin’s dimensional Bead Embroidery) and worked out how to finish it. And finish it I have. I’m quite pleased with it, but made a couple of errors which mean it will be staying with me rather than going into the shop…………. I made a booboo when I was cutting out the backing, forgetting the remnants of a sticky label. Which doesn’t look great. I looked at the big roll of heavy interfacing in my sewing drawer and said ‘ I can use that, not this ridiculously expensive beading stiffener’. This might have worked for a flat piece, but didn’t work for a bracelet as the interfacing has folded slightly, so I don’t have a smooth curve. On the bright side, the faux suede upholstery fabric I used (I started this so long ago I hadn’t heard of ultrasuede) does seem to be fine – it’s nice to work with and hasn’t frayed at all. Since it’s one of a large wad of samples I bought at a fabric sale I’m quite pleased since I now have a huge range of colours of backing to choose from. So here it is, my first completed bead embroidery piece – beads from my stash, a polaris clasp from Stitch N Craft and backing from my overstuffed fabric drawer. I’ve enjoyed the process more than I thought I would – I have always perhaps slightly looked down on bead embroidery, feeling it doesn’t have the engineering and construction challenges of the 3D beadweaving I’m more used to, but it does give an opportunity to paint with beads, and really make the most of the finishes and colours. Since finishing this I’ve made two more pieces, more about them soon (once they make it out of the nearly finished box!). Well the results of the Stitch N Craft Four Seasons Challenge are out and sadly no win for me. Above you can see Thomas modelling all four seasons at once, below some more detailed shots.